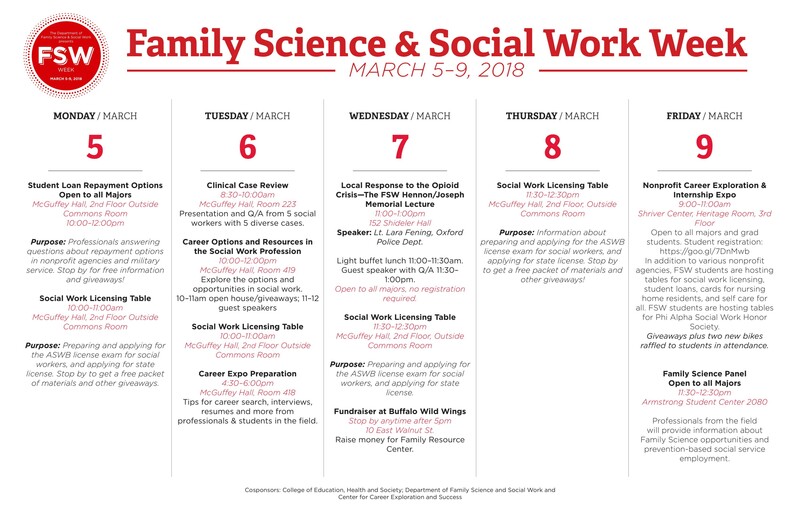 Family Science and Social Work Week will be held at Miami University March 5-9 across campus. A wide range of programs will be available and open to all majors, faculty and staff. No registration is required, plus food and giveaways will be available. Refer to the calendar for specific events including the Hennon-Joseph Memorial lecture on Wednesday March 7 on the local response to the opioid crisis and a Nonprofit Job/Internship Expo on Friday March 9th with Miami's Center for Career Exploration and Success. A special thank you to the undergraduate social work students in FSW 406 for developing and leading many of the programs and to the Center for Career Exploration and Success for their support.